Island Mountain Mine was so called because it used to look like an island as it was surrounded by the lake water, streams, and Willow River. 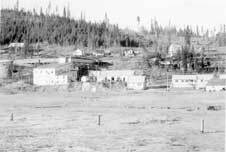 This was the site of the Island Mountain Mine Company, the rival of Fred Wells¹ Cariboo Gold Quartz Mining Company and established in the same year, 1933. Located at the bottom of Pooley Street are the mine buildings that are still standing. The bakery was housed in a large teal building, which was built in 1934. The building housed a dining hall and kitchen for the mine employees. The bakery sold baked goods to the community. The mine office for Island Mountain Mining Company is now the newly renovated Wells Museum. There are two walk-in vaults in the building. One was used to store gold and in the other was money. This building served as headquarters for the survey and geological crew as well as the administrative staff of the Island Mountain mine. The operation was taken over by the Cariboo Gold Quartz Mining Company in 1954, and an additional storey was added giving the building its unique architectural style. 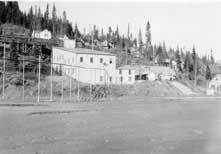 When the Cariboo Gold Quartz Mining Company left, the building served various uses but was vacant for some time. In 1990 the Wells Historical Society decided to move their museum to the old Island Mountain Mine Office. Phase 1 of the new Wells Museum project included restoring the original building for use as a museum with additional space for displays and artifact storage and conservation. The large lot has outdoor displays of many large mining artifacts, and includes a 1927 Model T Ford originally from Wells. Behind the Wells Museum is a building called the Island Mountain Mining Company Dry. Miners would get very muddy and wet during their shift, so they hung up their clothes and got changed in the dry. The clothes would be dry by their next shift. It is planned that the "Dry" will be used by the Wells Museum to provide storage for the museum. In the assay office, long cylinders of core samples drilled from the mine tunnels were subjected to chemical tests or "assays" to determine the gold content of the rock. Test results showing high gold content indicated to the mining company that further mining might be profitable.